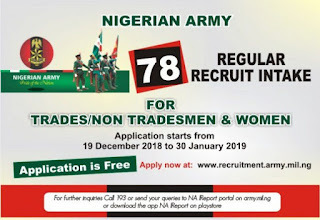 Nigerian Army, NA Seventy Eight Regular Recruit Intake (78th RRI) Application Form, Requirements, Documents Needed, Application Guidelines and Closing Date for Trades / Non-Trades and Women 2019/2020 [FREE OF CHARGE]. 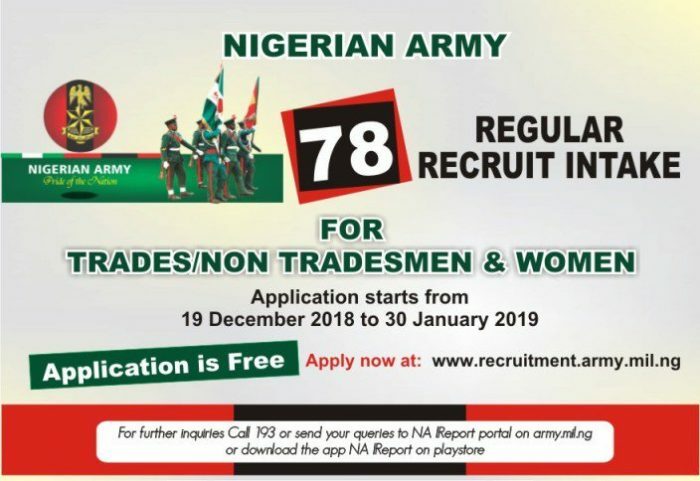 This is to announce to the general public and interested candidate that the Nigerian Army has opened the registration web portal for the 78RRI for trades/non tradesmen and women for 2019/2020 session. Online Registration for the Nigerian Army 78TH RRI exercise is scheduled to start from 19th December, 2018 - 29th January, 2019. APPLICATION IS FREE OF CHARGE!!! Nigerian Army (DSSC 24 & SSC 45) Shortlisted Candidates 2019/2020. The Nigerian Army Recruitment Portal is expected to shut down at exactly 11:59pm on 29th January, 2019.